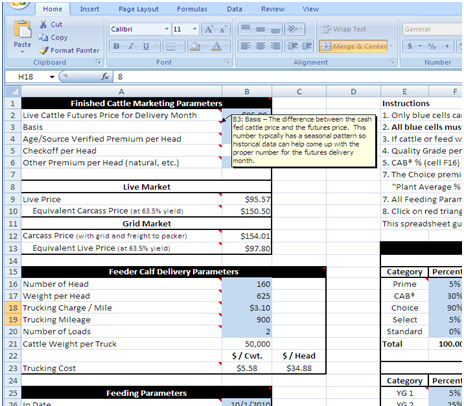 On Tuesday Laura shared a video on the breakeven calculator we created to help you estimate the value of your high-quality feeder cattle. You can download it for free here, then follow along as I walk through it. 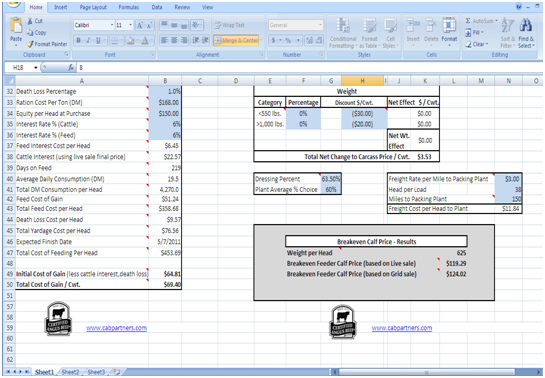 A breakeven calculator is not a new tool and every feedlot manager uses one. It takes expected selling price of finished cattle (as in Live Cattle futures) and the estimated cost of feeding them to calculate what the feedlot should pay to cover all costs or “break even.” These tools work great for cattle of “average” performance and carcass merit. What’s unique to this calculator, developed by our own Paul Dykstra? It can apply expected carcass merit and grid pricing results to more precisely value any set of feeder cattle with an eye toward beef quality. Here’s the key: If you produce above-average cattle, you must know what they’re worth to benefit from your extra effort. 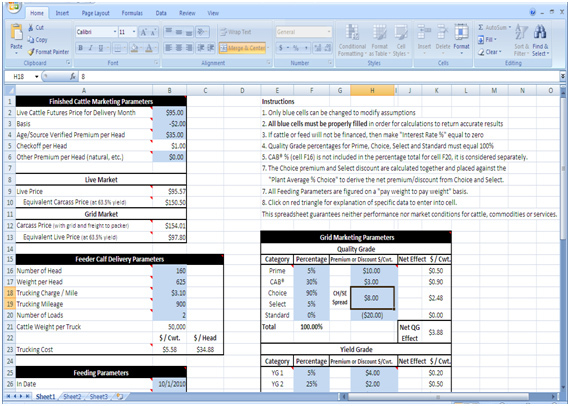 This CAB breakeven calculator is fairly simple to use, especially if you’re familiar with a spreadsheet. The screenshot below shows how the tool is laid out. The blue cells are input cells. Each of these have a default value. But keep in mind — the end calculation will only be as accurate as the input data! If you are serious about using this as a tool to calculate your breakeven, call potential feedlots and ask for their current numbers — actual yardage, feed and transportation costs, etc. Especially focus on making sure the numbers in the “feeding parameters” box are accurate according to the feedlot you intend to work with. Here are some more tips on asking the right questions when you sit down with a feedlot manager. Nearly every input cell has a “call out” box that gives further instruction for that particular cell to help explain what input data the calculator is asking for. Just hover your mouse cursor over the cell with a red triangle in the corner and the description pops up. Ultimately, when you are finished entering your data into each of the blue cells, two breakeven prices are calculated. One for grid sold and one for live sold. You can tweak your estimates or your grid premiums and discounts to see how that affects value. This is a great tool for those who have invested in superior Angus genetics and management for the high-quality target. With some expectation of performance and carcass merit, you can get a much better idea of the value of your calves. Later this week, I will run through some numbers to show how changing some performance and carcass measures can really impact feeder calf value. In the meantime,please feel free to give Paul or I a call or send us an email if you have questions on how the calculator works and how to make it work for you.